You’re sleepy, you’re drooping, you need something to perk you up and make you pay attention. Oh look, there’s an energy drink touting a long list of “special” ingredients — that must be the magic answer? Well, not really, says one study: Even though energy drink makers might brag about awakeamine, dontfallasleepaurite or other “special” proprietary concoctions designed to keep you peppy, energy drinks don’t work any better than ordinary caffeine at helping people pay attention. LiveScience takes a look at the study, where researchers monitored participants’ brain activity while they performed a task designed to require attention. Energy drinks are often downed by truck drivers going long distances who definitely don’t want to fall asleep at the wheel, or college students trying to remain focused on studying for The Big Exam. So paying attention is important to consumers who buy those drinks by the bajillions (rough estimate). Some participants drank 8 ounces of water before the task, others water with caffeine and then a third group guzzled water mixed with 5-Hour Energy. All caffeinated drinks were adjusted so they had equal amounts of caffeine per pound of participants’ body weight, and each drink was blue. Those who had consumed caffeinated drinks were able to respond quicker to the task — a change in letters on a computer screen — than those who just drank plain water. But there wasn’t any difference in brain activity between those who had straight caffeine and those who had 5-Hour Energy. 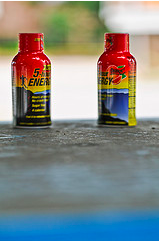 The only advantage, really, of 5-Hour Energy over say, a cup of coffee, is that the caffeine comes in a concentrated amount, making it easier and faster to swill at will. That ability to deliver high doses of caffeine is exactly why lawmakers and the Food and Drug Administration have been taking a closer look at the safety of energy drinks in general.